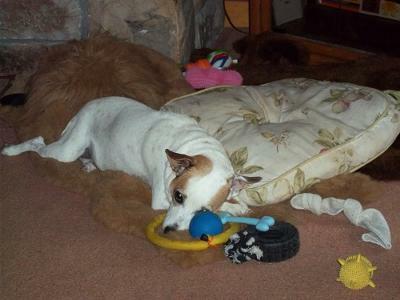 We lost our 11 1/2 year old JRT on Sept.2, 2011. It's been a month tommorrow and we're still in such pain missing Ivyjane. She was our walking coach, our watchdog, our entertainer, our hunter and chaser, our morning wake-up call and our best friend. She knew so many words that we didn't even teach her...it seemed like we were talking about a human 2year old when we would brag about her. She battled her cancer for as long as she could...even her locked up back leg wouldn't stop her from wanting to go on her daily walks....she was brave, a lot braver than we were. Please know little girl that we miss you more than words can say! Jeannie, Know that our thoughts are with you. Ivyjane was a special dog who lived a wonderful life with a family that cared about her deeply. What more could any of us ask out of life.